Since before I can remember, I have always enjoyed watching basketball games. I love the fast-paced edge-of-your-seat action of basketball, and since college I have always rooted for my alma mater. 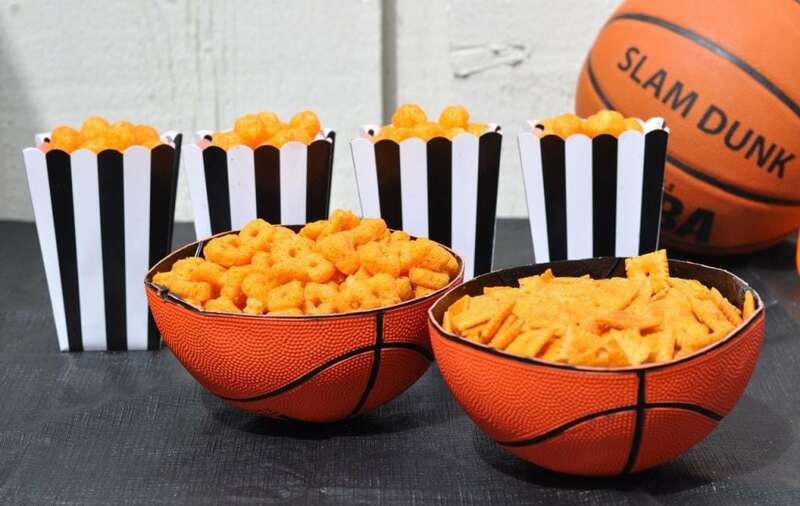 Since I love putting together parties, I thought that I’d share a few fun basketball party ideas with you to make watching your favorite games a little bit more exciting! To get ready for my party, I went to Target to pick up some supplies. I bought a couple regular-sized basketballs for the table, as well as a smaller mini basketball. I also picked up a bunch of other things, including some two boxes of Cheez-It crackers and a bag of the new Cheez-It Crunch’d in the Hot & Spicy Flavor. Cheez-It Crunch’d are a completely new product. 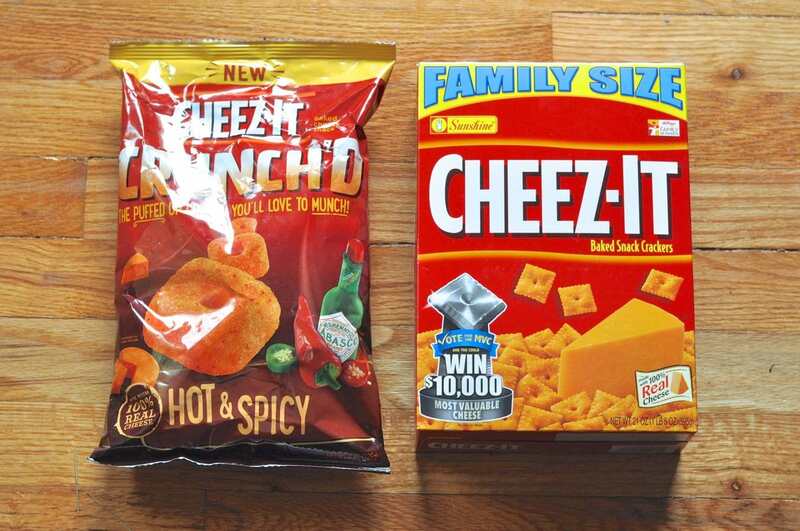 Crunch’d is Cheez-It’s first-ever crunchy puff made with 100% real cheese! I wanted everything on my table to be black, white, and orange, so I used a black tablecloth. One of my favorite parts of the table were the basketball bowls that I made out of a real basketball! I just LOVE these bowls, and think they are a fun and unique way to serve food. 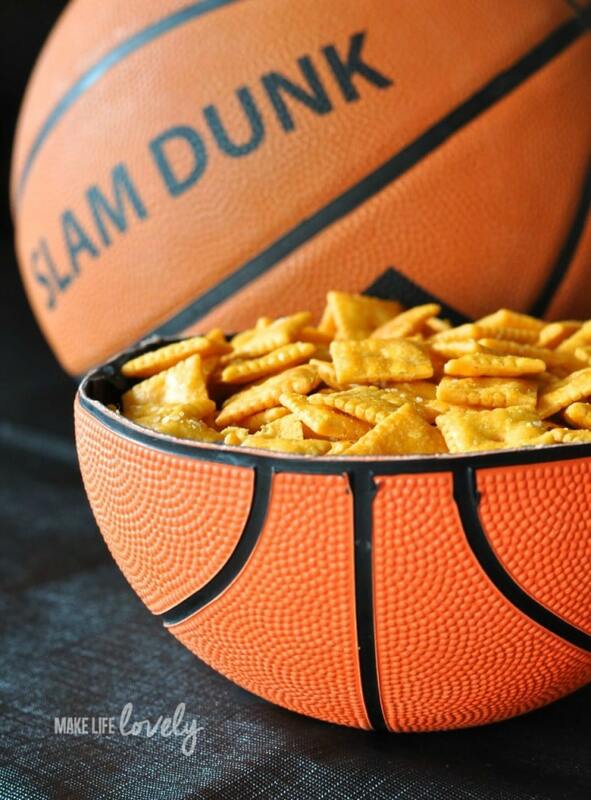 I mean, who wouldn’t love to eat out of a real basketball?! 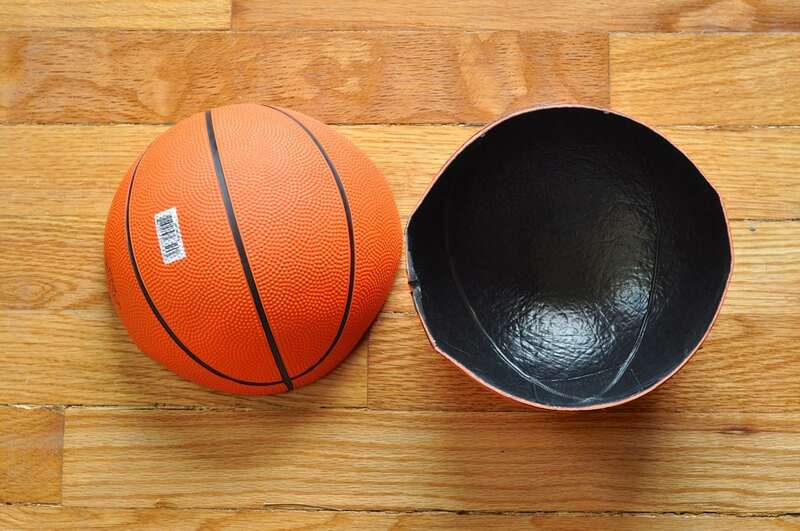 You can add tissue paper to the inside of the ball if you would like another surface between the food and the ball. I used a miniature ball for my bowls, but I assume that this would work just the same with a full-sized ball, too. I used my kitchen shears to cut the ball in half along the black line. I was actually surprised at how easy the ball was to cut! The only tricky part was once I got to the part of the ball where you fill it up with air, but I was still able to cut through it to cut the ball in half. And that’s it! 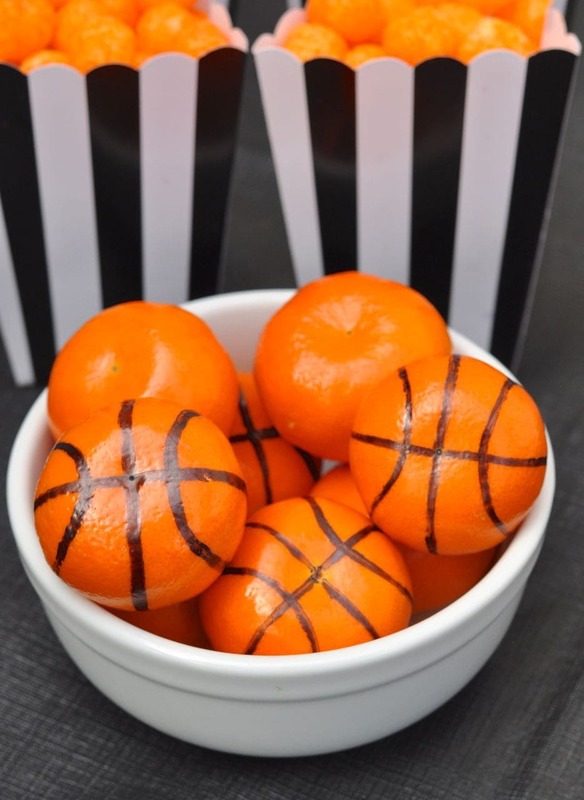 Simple, but such a fun way to add the basketball theme to any party or basketball game! I filled one bowl with Cheez-Its and the other bowl with Cheez-It Crunch’d for snacking on. 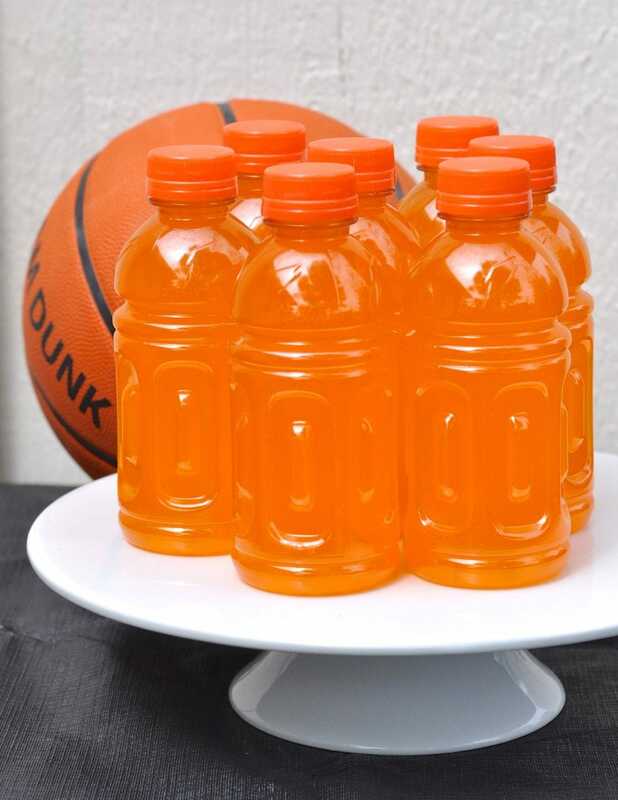 Orange sports drinks matched the rest of the table and were what I chose to serve, which I thought was perfect for a basket ball game! 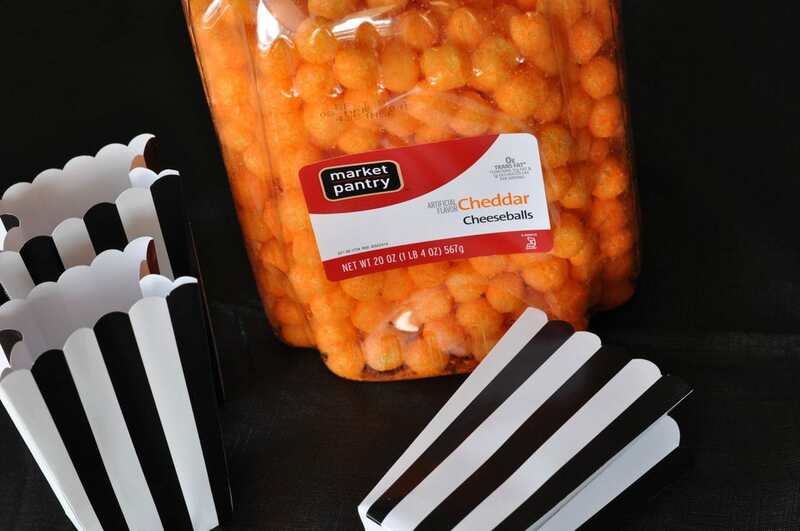 I found some little Market Pantry cheese puffs that reminded me of tiny little basketballs, so I bought them and added them to some cute striped black and white striped popcorn boxes that looked like referee shirts. As soon as I saw these tasty little mandarin oranges, I knew they would make delicious and healthy basketballs. I pulled out my trusty permanent marker, and drew the basketball lines on a few mandarins to throw in a bowl with some plain ones. I love the effect of simply adding a few marker lines! 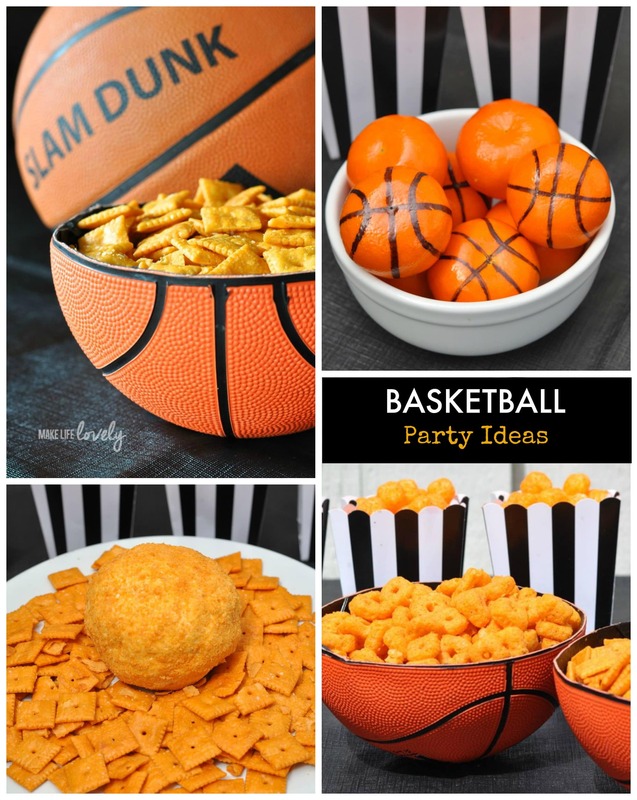 I also created a yummy snack for us when watching our basketball games- an orange basketball cheese ball! I made a delicious cheese ball recipe, but instead of crushed nuts on the outside, I used crushed Cheez-It crackers. The cheese ball had a yummy flavor and a satisfying crunch thanks to the Cheez-Its. Mix all of the ingredients in a medium bowl and put in the refrigerator for a few hours. Use your hands to shape the mixture into a ball. Place 1/2 cup of Cheez-It crackers into a plastic bag with the air pushed out, then use a rolling pin to crush them into crumbs. 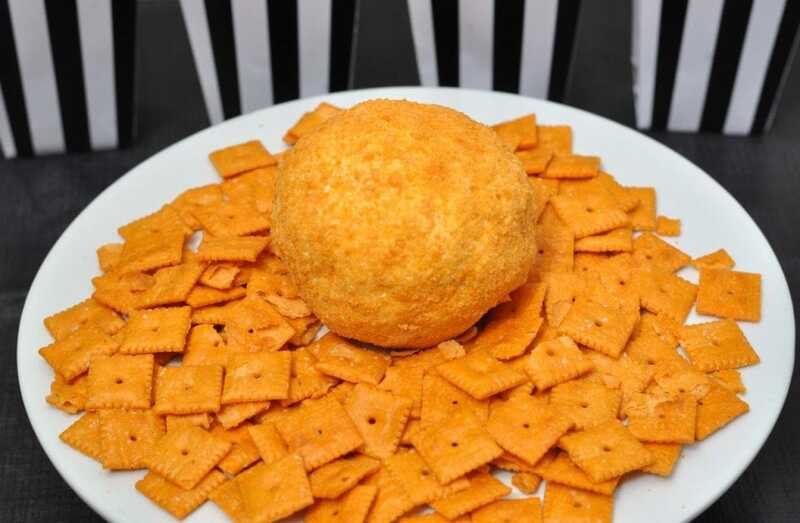 Roll the cheese ball into the crumbs, and serve with Cheez-It crackers. YUM!! 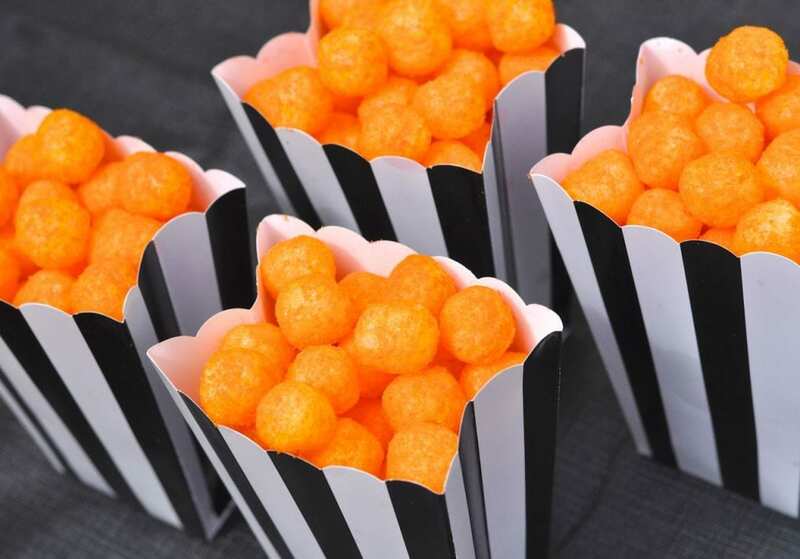 The perfect snack for eating while rooting for your favorite basketball team! 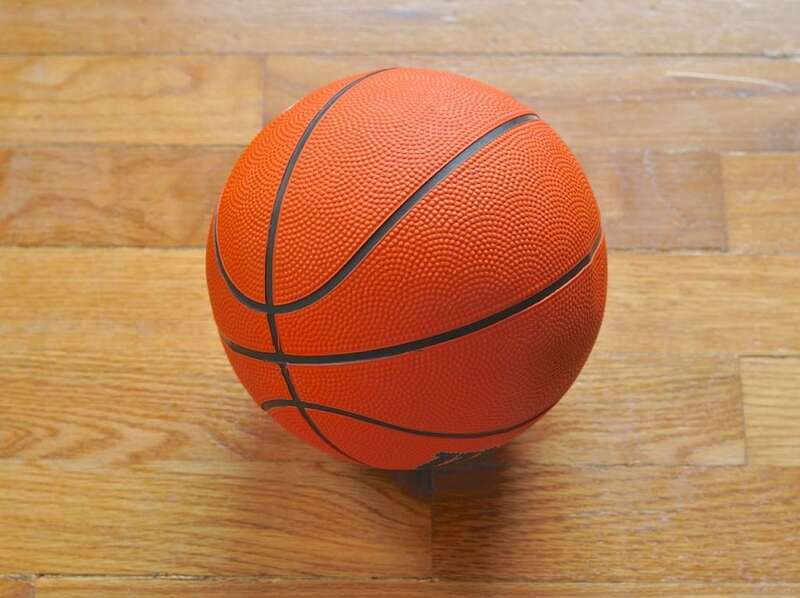 I hope you enjoyed my basketball party ideas! Be sure to check out the Most Valuable Cheese Contest that is taking place from Feb – April 2015. Users can vote on their favorite flavors and varieties from six popular Cheez-It flavors and play games for a chance to win $10,000! Also, right now Cheez-Its are on sale for 3/$8 at Target. 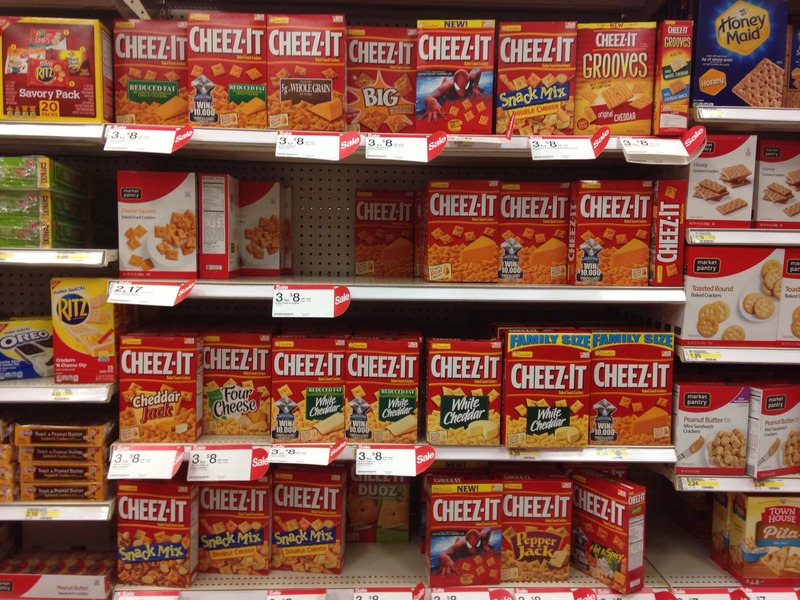 Shoppers can use Target’s Cartwheel app to save an additional 35% off of this sale price when they buy 3 varieties of Cheez-Its, woo hoo! 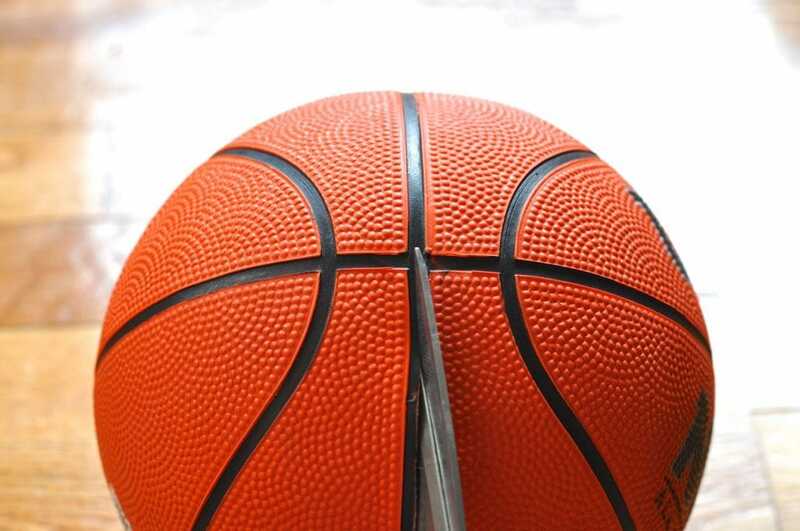 So do you love watching college basketball? 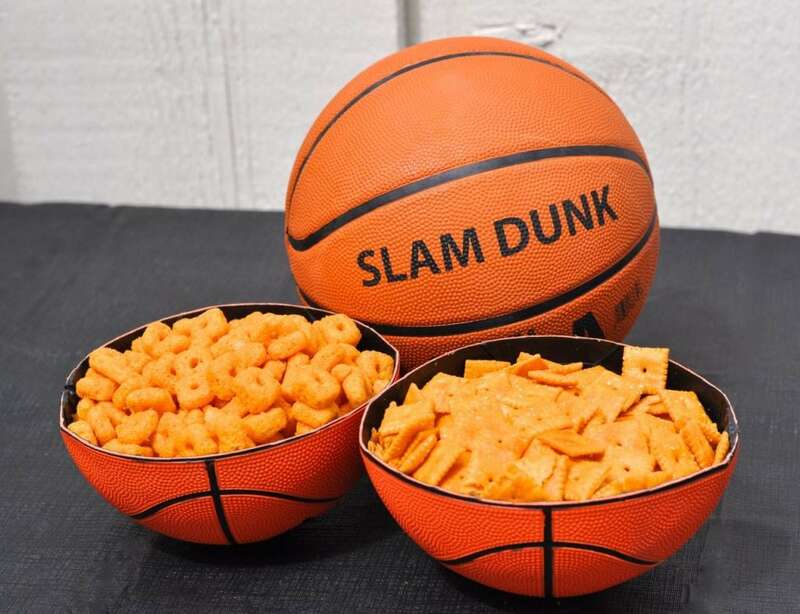 What’s your favorite snack to eat while watching your favorite basketball team?